Choosing a new garage door for your Canadian home is an exciting process. Once the new door is installed, your home will have a new, refreshed appearance and look! One essential decision you will want to make, prior to having the door installed is what colour you would like. Decide what style of garage door you want for your home. The first step, is to determine what style of door you would like. Door styles can feature traditional overhead doors to Carriage House style doors open outwards. Take into account the Canadian weather. If you live where temperatures get very cold in the winter, you will want to get an insulate door. In regards to colour selection, dark coloured doors will absorb light and can help keep a little warmer. On the other hand, light coloured garage doors will reflect sunlight, so the garage can feel a bit cooler. 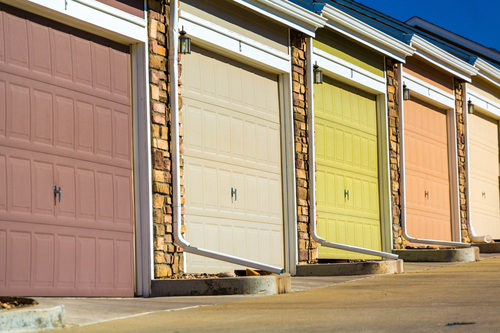 Consider how the garage door colour choice can affect the curb appeal of your home. Adding to the curb appeal of the home does help increase its overall value. A good choice if you are planning on selling your home, is to consider a modern, trendy colour. Otherwise, if you are planning on remaining in the home for quite some time, a neutral coloured door is a better choice. Select a garage door colour that complements the other colours of your home. A big part of choosing the right colour requires comparing how the colour of the door fits with the other exterior colours of your home, like your roof colour and siding colour. Compare what colour garage doors your neighbours have on their homes. Look around your neighbourhood and look what colour garage doors are on other homes. Think about how the door looks and how it affects the curb appeal of the home. It can be beneficial to try to choose a door colour that is different from your neighbours so all the homes do not look the same. Consider if you want a solid or two-tone coloured garage door. Some people like using a single solid colour door for their home while other like a two-toe coloured door. For instance, you could get a two-tone door in grey that has white trim on the outside. Consider how the garage door colour can create different illusions. Light coloured garage doors can make your home look bigger, while dark coloured garaged doors can make the home look a bit smaller. To see how a new garage door would look on your Canadian home, try out our free Design-A-Door App featured on our website. For further assistance, please feel free to contact Richards-Wilcox Doors at (800) 667-1572 today!